Welcome to Day #10 of Chocolate and Coffee Theme Week, and Day #2 of Chocolate and Almond Theme Week. 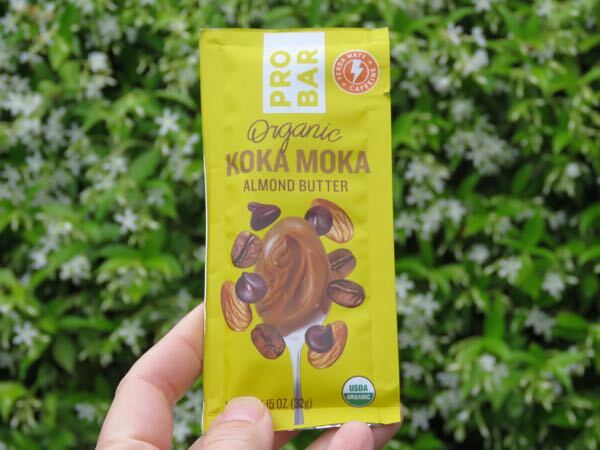 The Organic Koka Moka Almond Butter from Pro Bar (Park City, UT) was packaged in a handy, and relatively generous, single-serving packet. The company's relatively new line of organic nut butters are described as "The spreadable Probar." Looks can be deceiving. 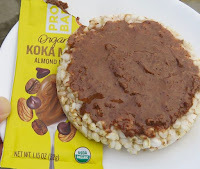 The aroma and flavor of this almond butter was unexpectedly light, with pleasant notes of vanilla angel's food cake and coconut—but not too sweet (thank you!)—vs. the expected "heavier" flavors of chocolate, coffee or even almond. 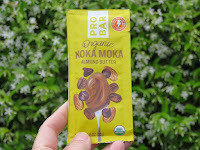 This nut butter would be interesting on a variety of edibles: cupcakes, pancakes, crackers, ice cream, etc.